We have veterinarians available 24/7 in case of emergency. Click the link below from your mobile device to be connected to the doctor on-call, or call us at 307-634-2912. Hunter Jack, our 3 legged clinic mascot. 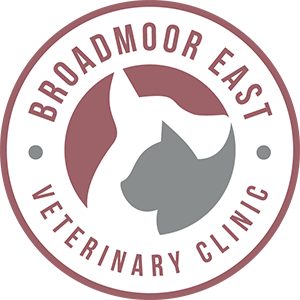 At Broadmoor East, we understand that your pet is an important member of your family. It is our mission to provide compassionate, quality veterinary care to your family. Our services are customized to meet the unique needs of each individual patient. As a full service animal hospital, we offer comprehensive care to pets in every stage of life, from pediatrics to geriatrics and everything in between. We specialize in early detection and proactive treatment of disease, pain management, orthopedic surgery and emergency care. We treat dogs, cats, rabbits, birds, reptiles, pocket pets (mice, rats, guinea pigs, etc. ), and exotic pets (ferrets, sugar gliders, etc. ).